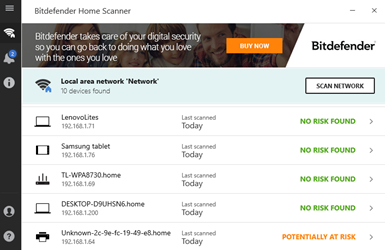 Bitdefender Home Scanner is a new free program that will allow you to scan your network at home, or in the office, and identify potential security issues. Although some of the results may sound a bit techy it may well provide fixes and actions for issues that you are able to implement to make your devices more secure and less prone to hacking. 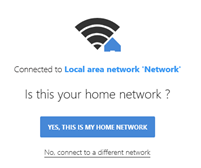 Your entire network will now be scanned and a report produced on the status of the devices connected to your home/office network. What you are aiming for is a complete set of green No Risks Found. Most devices will be scanned and results shown. In the example shown all devices are showing secure except for one, a printer showing as Potentially At Risk. In this case it is a Canon printer that is vulnerable. By clicking the data provided for this device the final recommendation is to go to the manufacturers website to get the latest software for the device. In this case it can be fixed by going to the Canon Support site and downloading the latest drivers. Author of the young adult fantasy novel series, The Portal Chronicles, including The Spider Gem and The Shimmering Gate. When not writing and promoting Taff runs a small IT support company, LITES PC based in Bourne UK. Has Your Data Been Stolen (PWNed)?